[SatNews] Newtec, a specialist in designing, developing and manufacturing equipment and technologies for satellite communications, was presented with the World Teleport Association (WTA) ‘Teleport Technology of the Year’ award for its Newtec Dialog® multiservice platform with Mx-DMA™ technology. 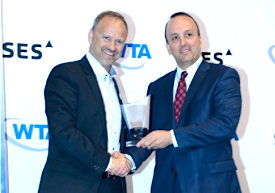 Serge Van Herck, CEO of Newtec, accepting the WTA ‘Teleport Technology of the Year Award’ on behalf of Newtec. The highly scalable, flexible and efficient multiservice IP-based platform is equipped with Newtec’s new return link technology—cross Dimensional Multiple Access (Mx-DMA). This combines the flexibility of MF-TDMA and the efficiency of SCPC, ensuring that operators are always using the most optimal modulation and bandwidth allocation. Newtec’s CEO Serge Van Herck accepted the award on behalf of Newtec at the annual ‘Teleport Awards for Excellence Ceremony and Luncheon’, held yesterday afternoon at this year’s SATELLITE Conference and Exhibition in Washington D.C.
"Newtec Dialog is the culmination of years of research and work, and I could not be prouder to have it backed by some of the industry’s most important players,” said Van Herck. “Newtec Dialog allows operators to build and adapt their infrastructure as their business and the market changes, while our patented Mx-DMA technology makes sure our customers benefit from both the most flexible and efficient technologies." Newtec Dialog is designed to be used for every type of networking, from the very smallest with five remotes, as an example, to the very largest, having hundreds of thousands of remotes. This allows operators to reduce OPEX by investing according to the growth of their business. "Combining flexibility and application excellence on a single platform was the main challenge," said Newtec’s Bart Van Poucke, product manager for Newtec Dialog. "The integrated network management system provides a single, unified interface for all configuration, monitoring and troubleshooting operations. Together with the hierarchical quality-of-service model, it makes the platform truly multiservice." The multiservice platform is Newtec’s third innovation to receive recognition from the WTA. 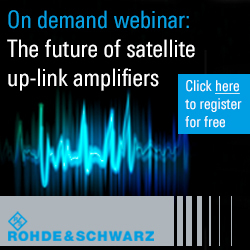 In 2009, the satellite specialist’s FlexACM® end-to-end technology was awarded the ‘Teleport Technology of the Year’ award, while its M6100 Broadcast Satellite Modulator achieved the same title four years later. Since 1995, the WTA has presented annual awards to companies and individuals that have dramatically demonstrated excellence in the field of teleport operations, development and technology. Since inception the WTA has been the only trade association that focuses on the business of satellite communications from the ground up. For more information about Newtec Dialog with Mx-DMA, visit www.newtec.eu/product/newtec-dialog.